The Loddon Mallee region occupies more than a quarter of Victoria and with one of the most consistently warm climates in the State, people flock to the region for the waterways of the Murray River, acclaimed restaurants and wineries, heritage towns, and grand forests. The Loddon Mallee region includes the two sub-regions of Loddon Campaspe and Mallee. Bendigo, Castlemaine, Echuca, Gisborne, Kerang, Kyneton, Maryborough, Mildura, Swan Hill, Wedderburn, Wycheproof. Loddon Mallee has a growing economy in tourism, viticulture, equine, horticulture, crops, cattle, manufacturing and wool production. As a major food producing area, the region is also home to a vibrant manufacturing and service sector. The Bendigo Bank is the only Australian bank to be headquartered in a regional area. The region offers a broad range of educational facilities including pre-schools, primary schools, secondary schools, TAFE campuses, La Trobe University campuses in Bendigo and Mildura, and the Swan Hill International College. With many sporting grounds, golf courses, water skiing, swimming, lawn bowls and tennis venues on offer, there is something for everyone. Theatres and arts centres are open throughout the year with community-based theatre companies upholding a strong tradition in regional communities. Festivals such as the Mildura Jazz, Food and Wine Festival, Bendigo Blues and Roots Festival, and significant events at Hanging Rock attract visitors from far and wide. Bendigo Art Gallery is also attracting substantial visitors with its temporary exhibitions as well as extensive collection of 19th century European Art and Australian art from 1800s onwards. Locals can also see Sun Loong the Chinese dragon parade through the streets of Bendigo for the annual four-day festival at Easter, listen to some of the country's finest folk artists at the Maldon Folk Festival, or stroll the many stunning gardens open during the Castlemaine Festival of Gardens. While in the region, visitors and locals alike enjoy our iconic and widely acknowledged restaurants whether in Piper St Kyneton, the wharf area of Echuca, our Goldfields towns of Castlemaine and Bendigo or destination dining in Mildura. Employment is growing in the services sectors, particularly in health and education, and related industries, such as IT and professional and business services, are also strong. The Bendigo area is benefiting from improved transport links with Melbourne. New opportunities are likely to emerge in renewable energy (particularly large scale solar), mineral sands and nature-based and Indigenous tourism. Viticulture and wine making is endangered by volatility in global markets and oversupply in some segments of local markets. Reduced water inflows in upper catchments are likely to produce continuing uncertainty for the horticulture sector. Growth in the mineral sands mining industries will increase freight traffic throughout the region, with flow-on for road and rail infrastructure. Parts of the region are more highly exposed to climate change than many parts of the State. The RDV information portal has more detailed data and statistics on the Loddon Mallee Region and regional Victoria more broadly. 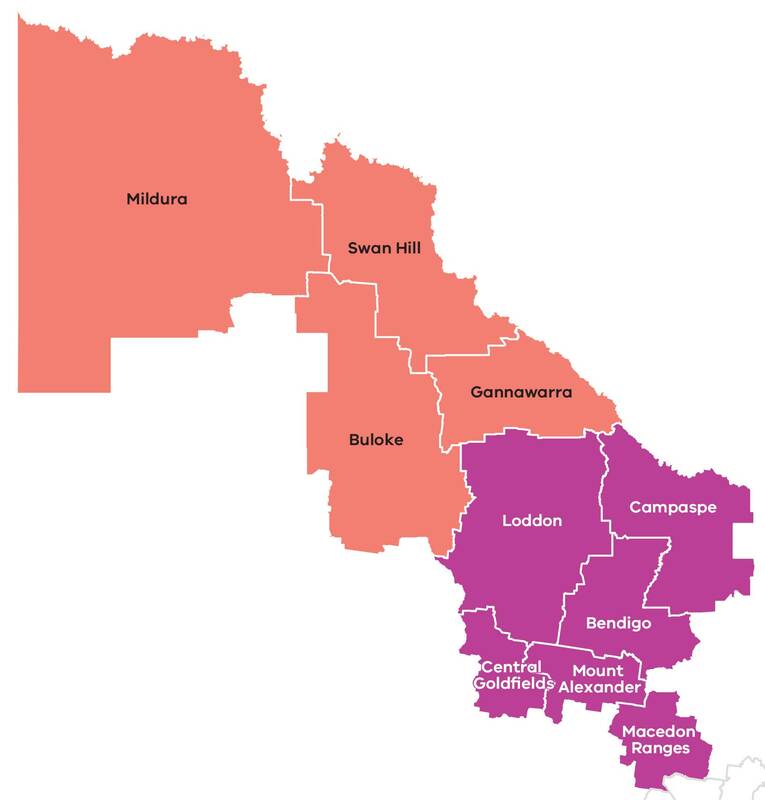 The Loddon Mallee North (Mallee) Regional Growth Plan and Loddon Mallee South (Loddon Campaspe) Regional Growth Plan are two of eight regional growth plans being prepared across Victoria. It provides a broad direction for regional land use and development as well as high level planning frameworks and the means to implement the strategic land use and infrastructure directions that are set out in the Regional Strategic Plans.